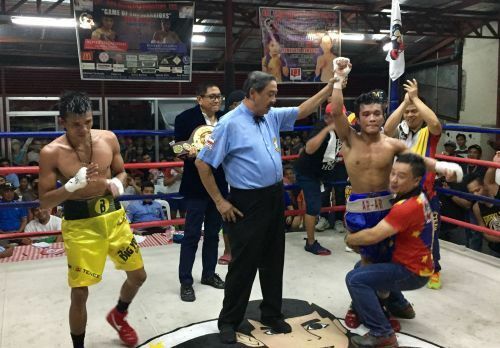 CAVITE, Philippines -- In hard-fought battles, Filipino warriors Andales and Dagayloan successfully retained their WBA Asia belts today (April 13) here in Bacoor City, Cavite, Philippines. In the thrilling main event, unbeaten WBA # 10 world-ranked "Asero" Andales (10-0, 2 KO's) of the Quibors Boxing Gym brawled his way to a unanimous decision win over more-experienced southpaw Cris Ganoza (17-3, 8 KO's) of Cebu's Big Yellow Stable to make the first defense of his WBA Asia Minimumweight Title. Referee Estrella raises the hand of ArAr Andales after his unanimous decision triumph. The rumble -- undoubtedly a very tough mission for both -- saw a more aggressive Andales bullying his way forward against the more refined Ganoza, who had his moments, half way thru the fight. 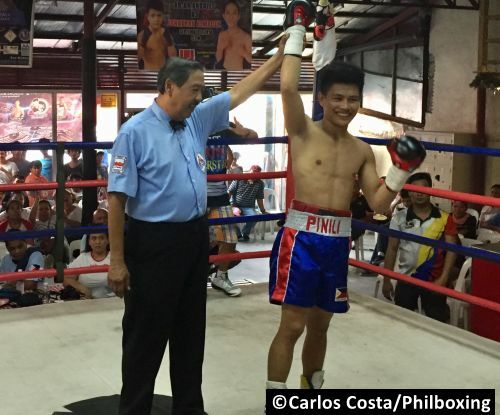 However, the shorter 19-year-old Andales, born in paradisiacal Northern Samar, landed more solid blows chapter after chapter to rightfully earn the united verdict from the three judges. In the entertaining co-feature, tough man of action "The Bull" Alphoe Dagayloan (13-2-5, 5 KO's) of Dipolog City edged unbeaten 20-year-old Domingo (11-1, 6 KO's) of the famed Cebu's ALA Gym to defend for the first time recently acquired WBA Asia Flyweight strap. The taller, heavily-tattooed Dagayloan -- a warrior who a few months ago traveled to Russia to knock out his undefeated opponent there -- today had his hands full against the Domingo, having to resort to all his available weaponry to narrowly overcome the younger man who displayed speed, boxing skills at a good work rate. After the clash, the general consensus among fans was 6 round for Dagayloan, 4 rounds for Domingo. Both boxers indeed displayed talent, heart, and stamina, unequivocal requirements to compete with advantage in boxing. 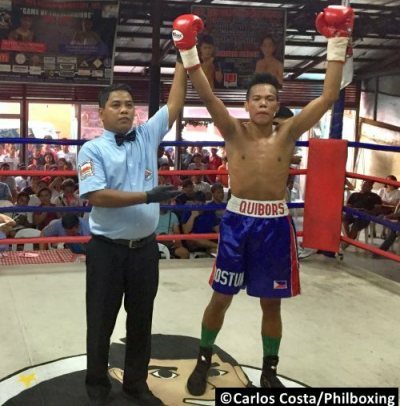 Furthermore, 20-year-old Quibors featherweight Rustom Doronio (5-1-1, 4 KO's) needed two chapters to overpowered Wilford D. Wade (5-3-2, 2 KO's) who hails from the beautiful northern Mindanao City of Iligan in Lanao del Norte Province. The taller Doronio rocked down Wade during the second round, ending the fame fast. Wade's first visit to the canvas was in the center of the square ring where the 8-second count from man Alfie. The second and last downing was in a neutral corner where the fray ended. Official time was 2:32 in round two. The fallen Wilford Wade was making his return to boxing after an almost 4-year hiatus. Unfortunately, things did not work out. 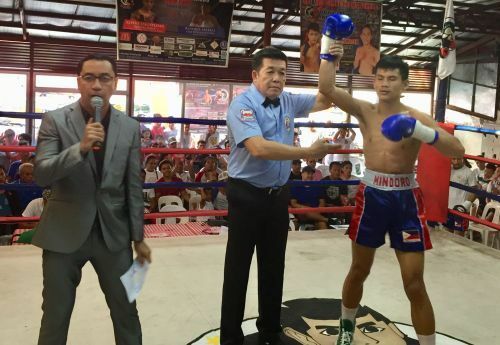 In welterweights, Mindoro (1-0, 1 KO) of the Quibors Stable entered with success into pro boxing by ravaging his unheralded opponent Jerry Kalaw (0-13) of the Gono Boxing Stable in Lipa City. From the getgo, the five-pound heavier Jerry Kalaw, wearing green and black did not look an owner of any fighting skills. Rather poor attacks and poor defense somehow got him till near the end of the third round where experienced third man Elmo Coloma -- an award-winning architect -- waived the fight off, spearing Kalaw of additional punishment. Moreover, super featherweight debutant Romer Pinili (1-0, 1 KO) mercilessly vaporized in one stanza his journeyman foe Oscar Lim (0-14) from the Knock Boxing Stable in Santo Tomas, Batangas, to successfully step for the first time into pro boxing. The referee for the tussle was veteran third man Ferdinand Estrella. Romer Pinili wins in debut. For the first bout of the entertaining fighting show, rookie minimumweight fighter Jerome Baloro displayed superior boxing talents over Ryan of the Pili Sports Academy in Camarines Sur throughout their four-round boxing match. The rendered three tallies of 40-36 left no doubt of who the better man was, though Jerome Baloro has indeed so much to boxing learn. The entertaining boxing was supervised by the Games and Amusement Board (GAB ) Boxing Chief Dioscoro "June" Bautista, working together with experienced men of boxing Antonio "Tony" Comia and Rafael "Raph" Dioknos. 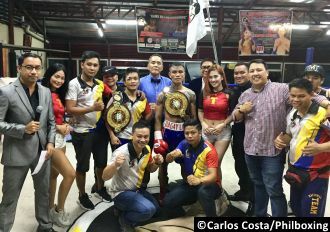 The WBA Asia double-header Road to Greatness Saturday, April 13, was a promotion of Joseph Quibral of Quibors Boxing in partnership with manager Orlando "Orly" Borcelango, promoter Gerry Balmes and the matchmaking effort of Gaudencio "Ding" Alipalo. The exciting card unfolded at Quibors Boxing Gym, Magdiwang Road in Bacoor City, Cavite, Philippines. The author Carlos Costa is a Panama boxing reporter living in the Philippines. Carlos can be reached at carlos512@hotmail.com and / +639184538152.